8 wheel tippers from BJ Waters are bulk bodied 32 tonne vehicles built for more demanding loads. They are used for transporting hazardous and bulk materials for the automotive, agricultural and construction industries across the UK and EU. Made from bulk tippers aluminium, steel or stainless steel, with barn doors or tail gates, sheets/nets and on-board weighing equipment, these tippers are very versatile and are always maintained to high standards. Not only are our 8 wheel tippers designed and built for reliability and heavy bulk materials, our haulage service is also second to none. The progress of your load is always tracked with modern equipment from collection to delivery, to check that everything is transported within the given time-frame. Along with competitive prices, you will get great value for money by working with us. 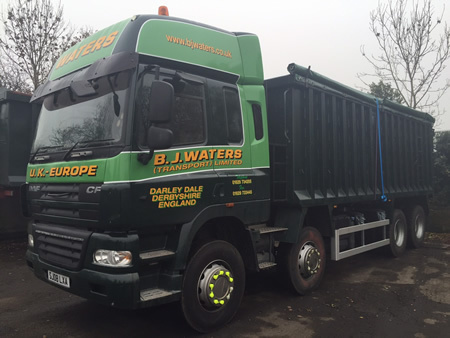 If you have further questions about our 8 wheel tippers or the specialist haulage services we offer, call 01629 734205 or email sales@bjwaters.co.uk.